Cross country moving is no easy task. For most families, relocating to another state means much more than fitting into a new school or getting used to a new climate. Moving means picking up each and every piece of your life—even the most fragile ones—and starting over fresh. The first thing you’ll want to do as you begin preparing your belongings for a move is organize your breakables separately and by size. Identify which among your things are the most breakable, and be sure you have enough wrapping paper and box space to separate the fragile items from the rest. 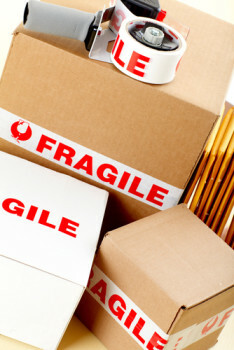 Once you have your boxes ready, group your items separately for each box. Be sure you have some larger items for the bottom of your boxes to give them support, and layer fragile items in decreasing size to be sure nothing on top is too heavy for what’s below. Now that your boxes and items are all organized, you can start wrapping. You can use newspaper if you have lots of old editions lying around, or you can pick up some special packing paper from any of local moving companies in your area. Wrap your items securely and with enough paper so that they will be cushioned while resting up against each other. As you fill your boxes, stop with each layer to fill in any empty space with packing peanuts. This will keep your items from shifting during the move and also create a soft nest for the next layer. Finally, when everything is ready for the big move, you’ll need to be smart about how you load up your vehicle. Many first-time movers make the mistake of loading up haphazardly, but since you only have one shot to get everything in, be sure to save room on top for breakable items. Of course, if all of this seems like more than you can handle during this stressful time in your life, your best bet is to hire a reliable moving company like Red Ball. Our knowledgeable relocation specialists have years of experience in moving consulting, planning, packing, and making sure everything from your old home makes it to your new home safe and sound. Fill out the free moving quote form above and one of our moving specialists will respond immediately.